In these moments, time stood still... 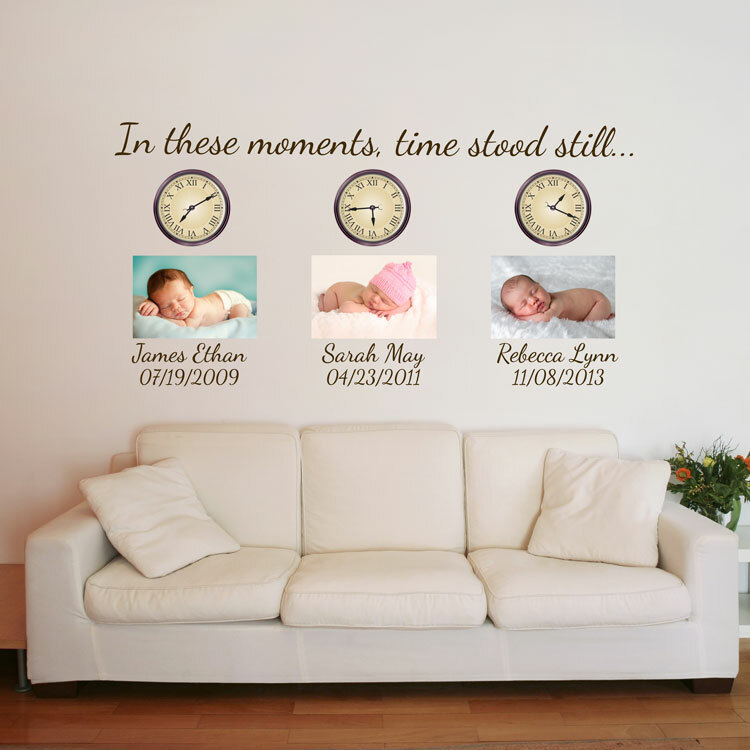 This family-oriented quote decal, is a perfect way to display those precious moments! This design can be customized just for you and the names (and even images!) that you'd like displayed! This inspirational wall sticker is ideal for an entrance, foyer, garage door, laundry room, bedroom, dorm, apartment, office, your child's space, or anywhere with a smooth, flat surface! Small - 60 inches wide by 22 inches high overall, quote measures 60 x 4in, names/dates measure 12 to 14 inches wide by 5 to 6 inches high. If photo decals are added, they will measure slightly wider than the names, as shown. Large version photos will measure approx 18 x 22in; Small version photos will measure approx 10 x 15in. If you need a custom size or need to add more names, dates and photos, just contact us! We can customize any of our wall decals according to your specifications. This listing is for the quote and up to 3 names and dates (as shown). Both versions come in sections for easier application. It's so pretty! Easy to put it on the wall. My room looks so beautiful now! Love Dali Decals, I wont use any other company.....! Decorating every room in my home is so much fun with Dali. Thank you so much for the wonderful tree. It looks great in the nursery. I hope that the baby loves it as much as I do!